She's bringing us all together. Yes, and we've come a long way in 44 years. A shame you're so resentful, you may have enjoyed it. She hasn't progressed much since college, apparently. Update: Some more interesting material. From these bleak generalities, Obama moves into specific complaints. Used to be, she will say, that you could count on a decent education in the neighborhood. But now there are all these charter schools and magnet schools that you have to “finagle” to get into. (Obama herself attended a magnet school, but never mind.) Health care is out of reach (“Let me tell you, don’t get sick in America”), pensions are disappearing, college is too expensive, and even if you can figure out a way to go to college you won’t be able to recoup the cost of the degree in many of the professions for which you needed it in the first place. Such optimism, not to mention hypocrisy. Nobody said life was easy. You need effort and hard work to achieve, not a bad attitude. I guess if you want it easy, you should be born a Kennedy. The Obamas’ financial standing has risen sharply in the past three years, largely as a result of the money Barack earned from writing “The Audacity of Hope.” In 2005, their income was $1.67 million, which was more than they had earned in the previous seven years combined. Might have to go on food stamps at this rate. 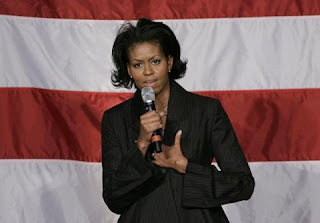 Just after Barack was elected to the United States Senate, Michelle received a large pay increase—from $121,910 in 2004 to $316,962 in 2005. “Mrs. Obama is extremely overpaid,” one citizen wrote in a letter to the editor of the Tribune, after the paper published a story questioning the timing of the award. “Now, what is the real reason behind such an inflated salary?” Her bosses at the University of Chicago Hospitals vigorously defended the raise, pointing out that it put her salary on a par with that of other vice-presidents at the hospital. More troubling to the Obamas’ image of civic rectitude is their entanglement with a campaign contributor named Antoin (Tony) Rezko in a 2005 real-estate deal. (Rezko is now awaiting trial on corruption charges.) That year, as the Tribune reported, the Obamas moved to a $1.65-million Georgian Revival mansion in Hyde Park, which features a thousand-bottle wine cellar and bookcases made of Honduran mahogany. On the day they bought the house, Rita Rezko, Tony’s wife, purchased the adjacent lot, which was wooded and empty, for $625,000. How will they get by? Perhaps there's a premature cockiness seeping through. Might want to wait until your husbands clinches the nomination, girlfriend. Back in the Explorer, I asked Obama if she thought that her husband, as the Democratic nominee, could take John McCain. “Oh, yeah. We got him,” she replied. Thanks to Gateway Pundit and Hot Air here, here and here for the links. Update II: A magnificent comment from over at Gateway Pundit. Not our America, Michelle. Our America doesn't live in 1.6 million $ homes, and go to cocktail parties in fancy Northside penthouses. Our America isn't mean, cynical, guided by fear, or slothful. Do you know any actual Americans? Our America donates money to St. Judes hospital. Our America gives time to their church fundraiser after working hard all week long. Our America doesn't care about skin color, or ethnic background, or religion, when people are in trouble. We simply write checks, send food and water and clothes, and volunteer our homes as shelter. Our America supports our heros who fight overseas. Our America doesn't believe that wearing a flag pin on our lapel is a cheap, maudlin trick. We wear it near our hearts to remember our friends and family members who are in uniform today, and those who fought and died in the past; our fathers, brothers, uncles, and best friends. In our America, we aren't ashamed of the symbols of patriotism. Our America believes that no one owes us anything, and is optimistic about the future we are building for our families. Our America is creative, entrepreneurial, gets in early and stays late. I guess you live in some other America, Michelle. Please keep it away from the one we love. Update III: Also linked by Tammy Bruce, Flopping Aces, McClatchy Watch, The Red Pill, No More Spin, The Political Post, Nine-Sixteenths, Again, American Princess, Blogs for John McCain, Pirate's Cove, Ace of Spades HQ, NewsBusters, NRO's Campaign Spot, Riehl World View, Sister Toldjah, Moonbattery, Urban Grounds.